PETALING JAYA (March 21): UEM Sunrise Bhd has launched its first Rumah Wilayah Persekutuan (RUMAWIP) project Kondominium Kiara Kasih yesterday, it said in a statement today. The project, which has a GDV of about RM217.5 million, is coming up on a 2.14-acre freehold plot and offers 719 units in a single 40-storey tower. Each three-bedroom unit is priced at RM300,000, has a built-up of 850 sq ft and comes with a car parking bay. The development’s facilities include an entrance plaza, open lawn, terraced garden, nursery, pocket garden, surau, reading room, playground, BBQ area, swimming pool, wading pool, sky fitness station and a multipurpose hall. The project is slated for completion in October 2022. Surrounding schools of the project include Sekolah Kebangsaan (SK) Taman Sri Sinar, SK Sri Hartamas, Sekolah Menengah Sri Hartamas, SK Kiaramas and SMK Kiaramas. “Kondominium Kiara Kasih offers well-planned residential and facilities that cater to various family-oriented needs. Residents of this modern high-rise living can be part of a connected and well-organised community living in Segambut, neighbouring Mont’Kiara,” said UEM Sunrise managing director and chief executive officer Anwah Syahrin Abdul Ajib in a statement. “This project reaffirms our commitment to build affordable housing in support of the government’s home ownership aspiration for the rakyat. “Kondominium Kiara Kasih is strategically located and is suitable for young adults who need a base for them to grow their family in the city centre. 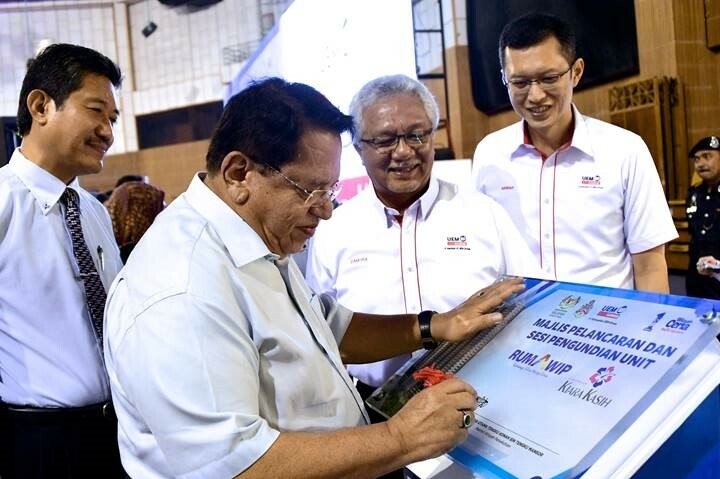 We really hope that the rakyat will take advantage of this RUMAWIP project,” he added. The first 350 purchasers who sign their sales and purchase agreements with complete loan documentation will receive a RM1,000 IKEA gift card by UEM Sunrise. Anwar added that UEM Sunrise has also launched a few affordable housing projects in Iskandar Puteri, Johor. “To date, in collaboration with Denia Development Sdn Bhd, UEM Sunrise saw the completion and handover of more than 4,000 units of residences and shopoffices mainly landed, in Taman Nusantara. “In 2016, 351 units of 2-storey terraced houses of Bayu Nusantara project were completed and handed over to the purchasers. We will be completing another 1,217 units of affordable properties in 3Q18 under the Denai Nusantara project,” he added. Also present at the launch were Federal Territories (FT) minister Datuk Seri Utama Tengku Adnan Tengku Mansor. Also present at the launch were UEM Sunrise chairman Tan Sri Zamzamzairani Mohd Isa, FT ministry chief secretary Datuk Seri Adnan Md Ikhsan and KL mayor Tan Sri Mohd Amin Nordin Abd Aziz.